Photos from "Everywhere Fun Fair" Vacation Bible School from June 24-28 plus the Sunday Service presentation. Photos from various ministry events during the first quarter of 2013. Photos from the Youth Winter retreat in South Bay California, Dec. 27-29, 2012. Pictures from the 4th Annual pumpkin carve event. Children of all ages went deep with their relationship with God as they experienced Operation Overboard. Photos from "A Teddy Bear Picnic" Mother-Daughter event. Photos from all Easter activities including Children's preEaster event, Easter sunrise and Easter Sunday service. Photos from the Handel's Messiah concert - Palm Sunday 2012. 'Tis the season for celebration! Church photos from all advent activities. Children of all ages got to carry out God's recipe in the Shake It Up Cafe. Photos from various activities throughout the year. Children of all ages blasted off into outer space in Galactic Blast. Photos from the 87th annual Mother Daughter event. Photos from Laity Sunday, Love Tea, BFF, Spaghetti Dinner and CPR Training . Pictures from Palm Sunday through Easter. Children of all ages learned how to live on the edge in Camp Edge. Pictures from the Mother Daughter luncheon, Mother's Day and Myrt's Garden dedication. Photos from the Lenten dinners, spring cleaning, Spaghetti dinner and Easter. Photos from Angel's night, Ministry Fair and World Communion Sunday. The pirates are here but they don't do anything! Witness how the children learned about courage, faith and love. Not to be outdone, the women also had a song and a meal for all the men of the church. The women of the church were treated to a luncheon by the Men's Group after the worship service. Enjoy all the wonderful photos from "Pretty as a Princess" and see how dreams came true. More photos from the first quarter! Photos from all the Advent 2007 activities! 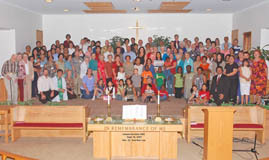 Church group picture taken after worship service, September 16, 2007. Cheeeeese! The circus came to town! From performers to servers, mothers and daughters, everyone enjoyed the circus, and we have the photos to prove it. The children took the plunge! Take a look at how the kids enjoyed their season pass as they learned about worship, service and faith.